Grapevine at Bedfords, Norwich, with Fred’s House, Dannie Nicholls, and The Tin Heart Troubadours, 2 April 2014. Review and photos. Bedfords Bar was jam-packed for this month’s Grapevine, and deservedly so for this fine line up. I’d been looking forward to this ever since I heard Steve playing Danni Nicholls’ album “A Little Redemption” at last month’s event, and also for the chance to hear the wonderful Fred’s House with a full band line up. 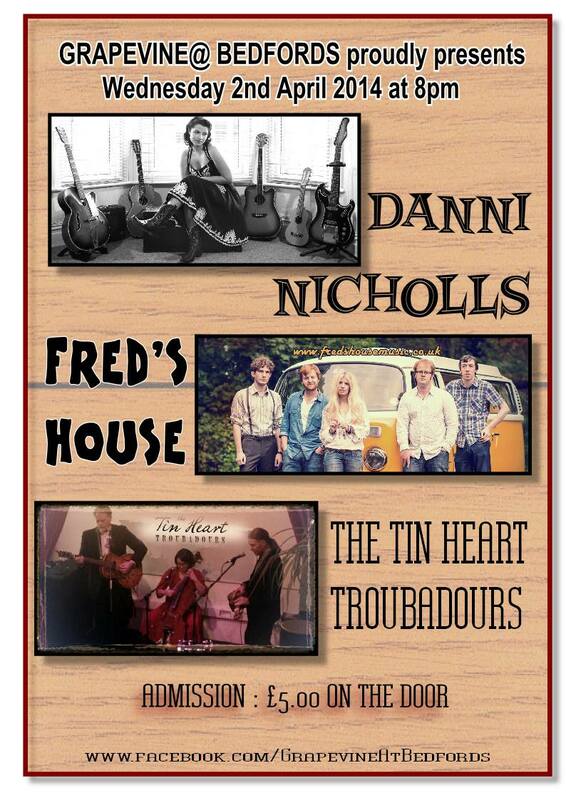 Completing the bill were The Tin Heart Troubadours who I was hearing for the first time. Formed from the ashes of The Proposition, The Tin Heart Troubadours are a trio that feature guitar, dobro and cello which work very nicely together and their set of seven or so numbers had some highlights such as Nobody’s Gonna Miss Me, and one titled something along the lines of Crap Boyfriend which had some marvellous riffs. Described as a “tiny lady on violin” who “adds a bit of class to the band” Clare does actually add class and distinctive sound which compliments their country/Americana sound nicely. Looking and sounding every inch a star in the making Danni Nicholls is surely destined for great things. She was a revelation tonight, she has a real rock aura about her, sultry looks, whiskey drinking and all in black with a guitar that looks as if it probably has a few tales of its own to tell she has the voice to go with it all. And the stories. Introducing the songs with tales from Nashville and even a song about a man who sold dreams from a suitcase that she wondered if perhaps it should have been included on the album (it should but it can go on the next one!) I will be very surprised if great things don’t happen for Danni, such is this talent. She is a spellbinding performer and there are traces of Johnny Cash, Patsy Cline, Gillian Welch, Elvis Presely and as my friend Dan said, even Chris Isaac. It’s not often one can make these comparisons of attributes from both sexes to one person but there truly are moments where one can hear and see a likeness. She has a classic country or rockabilly beauty, her eyes at times have that brooding sideways scanning look of Elvis, she has the cool of Cash, and a stunning voice. Definitely one to watch and certainly check out her album. We could be talking about ‘the time she played in Bedfords’ before too long. Steve introduced me to Fred’s House last summer and I was very much taken with their songs and harmonies, and also themselves as lovely people. That time they played as a trio but tonight it was the full band and they played a blinder of a set. Vicki and Griff sharing vocals and great chemistry, their songs are a good blend of reflective, melancholy, upbeat and joyous, with just the right amount of introduction to the stories, some of which are intensely personal. They can also turn their hand to a very decent cover too, last time it was Norwegian Wood, and tonight it was a superb and very well received version of Old Man by Neil Young. Grapevine is a regular event of extremely high quality and I have total faith in Steve Howlett’s judgement. Even by these extraordinary standards tonight was very, very special. It would have been a travesty if the place had not been full, but it was deservedly rammed. Well done as always to Steve and Jan, Stuart on sound, all the acts and all at Bedfords. Thank you. I was a bit ill for a few days before this one and worried I might miss it, I am so grateful to have been present. This entry was posted in live music and dance and tagged Acoustic music, bedfords, Danni Nicholls, fred's house, grapevine, live music, norwich, photos, review, shashamane, steve howlett, Tin Heart Troubadours. Bookmark the permalink.